He's one of the world’s leading surgeons in spine deformity. Here, he discusses his belief in shared learning, tells why he has abandoned anterior approaches and explains why he had to say "no" three times to one of his early mentors and one of the founding members of the Scoliosis Research Society (SRS). 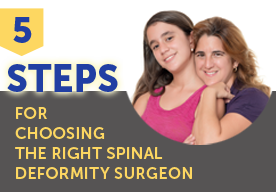 What made you chose spine deformity as your specialty and who was your biggest mentor? The most influential person in my early career was Dr Ron DeWald, but in a very unusual way. During medical school, I spent a month on rotation with Dr DeWald at Rush University in Chicago and was amazed with what he was doing with deformed children and adults. I was particularly fascinated by thoracotomies and seeing all the organs being pushed out of the way to get to the spine. That’s what attracted me to spine surgery—it was “real surgery”. Dr Dewald was also in charge of the residency program at Rush University and wanted me to go there for my residency, but Washington University in St. Louis called me half way through my interviews and said if I want the spot I have to decide immediately as it was a guaranteed spot in their Orthopedic Surgery residency. However, this meant turning down the opportunity with Dr Dewald. It took me a long time to work up the courage to call him and to decline the opportunity. I became a resident at Washington University and started working with Dr. Keith Bridwell, who was Dr DeWald’s protégé. And then the same thing happened again for my fellowship training. I interviewed with Dr Dewald and accepted a spot at his fellowship. I went back home to St. Louis and Dr Bridwell offered me a fellowship spot as he was planning to start a fellowship and I would be his first fellow. I wanted to stay in St Louis as I had just gotten married and my wife was going to do her internship in Hospital administration in St Louis in the same year, so we’d have spent the first year of our marriage apart. I had to call Dr DeWald and declined his offer for the second time, now as a fellow. After my fellowship, Washington University offered me a staff position. I stayed there for twenty-five years. In 1999, Dr DeWald called me and asked me to consider coming to Rush university as an endowed Ronald L. Dewald professor of spine deformity surgery, the first endowed professorship exclusively devoted to spine deformity surgery. Obviously I was extremely honored by the offer, but my wife and my children didn’t want to leave St.Louis at that time, so I had to again decline his offer. I have the greatest respect for Dr Dewald, and those three phone calls were some of the hardest I’ve ever had to make. What is your most frequent surgery? My most common operation now is a revision spine deformity surgery with a vertebral column resection (VCR). Since the year 2000, I do all approaches posteriorly. Even though I became a scoliosis surgeon because I was fascinated by the anterior approaches, I abandoned them. The reason was excessive patient morbidity. Now they’re less invasive but back then, in the late 90s, they were too morbid for the patient. When I started promoting posterior surgery for all spine deformities, my approach was somewhat unique at the time, but it was ultimately the right thing and I’m very proud of that. One should never be afraid to go against the grain. How do you share your knowledge and expertise? My fellows have been instrumental—much of the legwork for my clinical research is done by my fellows. Over 1000 surgeons from across the world have visited me. When I look now at the Global Spine Congress 2018 program, many of the surgeons are people who I have trained or those who have visited me, and I had a little piece in their education, which makes me very proud. I can only treat one patient at a time, but if I can help other surgeons treat their patients better, then my outreach is exponential. I’m very fortunate to have the ability to vicariously help many patients through the fellows I’ve trained and the surgeons who visited me and then went back home and applied what they learned to help their patients. Could you tell us more about what led to your creating the Lenke classification system? Juergen Harms, three of the leading scoliosis surgeons in the world, to discuss whether scoliosis should be treated posteriorly or anteriorly. Dr Bridwell had been asked to moderate a small meeting of these three surgeons, but couldn’t make it, so I was invited instead. For eight hours my job was to run the slide projectors, and I just listened. The first thing they were both asked was “how would you classify this curve”—and the gold standard at that time was the King-Moe classification system. However, for over 90% of cases, they disagreed on classification. I was sitting there thinking how will they ever agree on how to treat scoliosis if they can’t agree on what the classification is? By the end of the day, a light bulb went off in my head that we need a better classification system. I was invited me to be part of that study group, which still exists today. I used it as my platform to launch the Lenke classification system of scoliosis. Its publication in 1999 was a huge turning point in my academic career. In 2018 it’s still the most widely used classification system for scoliosis worldwide. 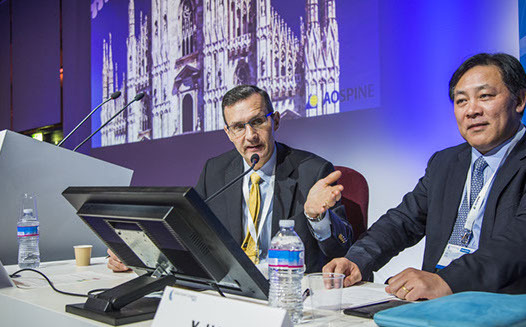 ​Can you tell us more about your activities with the AOSpine Knowledge Forum Deformity? Our first project was Scoli-RISK 1, on which we now have an extension that we’re going to follow five years postoperatively. Two years ago, we started the Prospective Evaluation of Elderly Deformity Surgery (PEEDS) study. Also, similar to scoliosis there’s no common knowledge or classification of complications. Because of that, we’re leading the effort to develop and validate a reliable system for categorizing and classifying various complications during and following adult spinal deformity surgery working with the International Spine Study Group (ISSG)—it will be a gold standard and a legacy we can be very proud of. Once you have a common language and classification, so many things branch off from that basic foundation. This will be a huge contribution to spine surgery. I finished my chairmanship of the Knowledge Forum Deformity two years ago. Marinus de Kleuver took over and is doing a phenomenal job leading those efforts. You have won numerous awards in your career. What achievement are you most proud of? Getting the Scoli-RISK-1 study off the ground and completed to a two-year follow-up was definitely a career highlight. Michael Fehlings and I discussed starting a clinical trial using the promising neuroprotective agent Riluzole, but we soon realized there wasn’t an accepted rate of neurological complication for scoliosis surgery. We had to go back to step one, which was to figure out the gold standard rate, and that became the Scoli-RISK 1 study. Without those discussions this would never have happened, Michael Fehlings deserves credit for that, as well as AOSpine and SRS for supporting this. Around the same time, I was appointed chair of the AOSpine Knowledge Forum Deformity, a select group of surgeons from around world who are the best academically minded in scoliosis and spine deformity work. I was privileged to be the first chair of that group. Collaboration is essential for the betterment of our profession. It was great to see these groups coming together and putting their own egos aside. What’s been the most interesting paper you’ve seen in the past year or so? The GAP analysis published by Ahmet Alanay. It looked at how we evaluate patients’ radiographs for complications after spine deformity surgery—how can we predict preoperatively who’s at risk of mechanical and malalignment complications, which is an unsolved problem in spinal surgery. His analysis has been replicated and is an objective way of organizing and predicting who will have mechanical complications. Another is Dr. Chris Ames and others working on predictive analytics and modeling, including areas such as patient frailty and patient co-morbidities to predict who will do well with spinal surgery and who may not, through a more automated and objective way of selecting patients for this kind of surgery. I think that type of modeling is already playing a role in our specialty and will play a huge role going forward because even with radiographic indications for spine surgery, if you don’t have the health, emotional and psychological wellbeing and other areas to predict a good outcome, you shouldn’t have that surgery. Outside of work, how do you unwind and maintain a work-life balance? I’ve always been an exercise fanatic and work regularly with a trainer to try and keep in good shape. My family is also really important to me. I spend my free time with my lovely wife Beth and our three children, who are now in their 20s. I’m getting better at that now but I’m not a role model for leading a balanced life—as a busy clinician and academician, it seems like I spend more time trying to cope with the imbalance. However, I certainly wouldn’t be where I am now without the support of my wife. Her love and her commitment has been the solid foundation for my career and my success. You can’t be successful without having great people around you both at work and at home and I have had great people helping me at work as well throughout my entire career. I’m a very fortunate person. Why would you recommend someone become a member of AOSpine? It’s the largest group of spine surgeons in the world, with a truly global reach. Its educational resources are the best in the world, and the addition of the Knowledge Forum adds research credibility, which is an incredible combination. The more you put into it, the more you will get back.